Designed with input from law enforcement and special operations personnel, the CAVU Full-Frame Standard Lens Sunglasses from 5.11 Tactical and Wiley X® Eyewear are virtually indestructible. The lenses are made from die-cut Selenite® polycarbonate, ten times more impact-resistant than glass or resin, and have a T-Shell® coating for added resistance to scratching and cracking. A smoke tinting offers a low level of light transmission, total UVA and UVB protection without color distortion and doesn't hinder or distort peripheral vision. The impressive engineering behind 5.11's lenses exceeds ANSI Z87.1-2003 and EN 166 (F) High Velocity Impact Safety and Optical Standards. 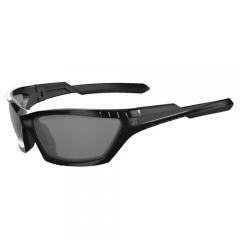 The weightless Grilamid® TR-90 frames ensure impressive strength and high-resistance to chemical and UV damage. TPR inserts on the nose piece and temples prevent the glasses from sliding during activity. The glasses include a Slick Stick® compatible carry case, a microfiber cleaning bag and neck strap for safe storage and versatile carry options.